According to reports from the Cleveland Browns camp, quarterback Robert Griffin III (RG3) will be the Team’s starter. RG3 sat out all of last season when he was with the Washington Redskins but his talent clearly makes him the logical starter if he can stay healthy and, according to Coach Hue Jackson”humble”. 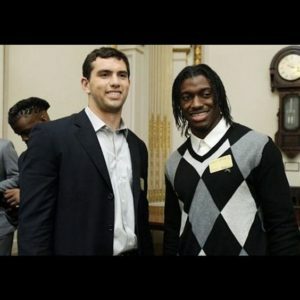 Griffin won the Heisman trophy in 2011 while at Baylor University and was chosen #2 in the 2012 NFL draft (Colts QB Andrew Luck was drafted #1). Fun fact, Griffin graduated Baylor in three years with a 3.67 GPA in political science and had started his masters degree a year before entering the draft. Amar’e Stoudemire signed a non-guaranteed contract with the New York Knicks so he could immediately announce his retirement. At 33 years old, Amar’e could still decide to decide to play overseas in China or for Hapoel Jerusalem (a team he co-owns). On August 5th, the Rio Olympics will officially begin but with only 11 days to go, many athletes are refusing to move into the Olympic Village. Their complaints sound legitimate. Apparently the toilets are overflowing, the pipes are leaking and the floors are dirty. These conditions are part of a long list of Rio problems. Download Our Free iPhone App! We are happy to announce that FemaleFan now has a free iPhone app. You can download it from the App Store.